Renee Rosnes has seen her share of jazz supergroups. Thirty years ago, she held down the piano chair with Out of the Blue, a youthful all-star crew formed by Blue Note Records. She was a charter member of the SFJAZZ Collective. So she had a wealth of experience to draw from when she recently formed a supergroup of her own. Reaching across generations and nationalities, Rosnes enlisted some of the most accomplished artists on the scene: Trumpeter Ingrid Jensen, clarinetist Anat Cohen, tenor saxophonist Melissa Aldana, drummer Allison Miller, bassist Noriko Ueda and vocalist Cécile McLorin Salvant. This impressive cohort went on its first tour under the banner of International Women's Day, after which it acquired a new name: Artemis, after the Greek goddess of the hunt. 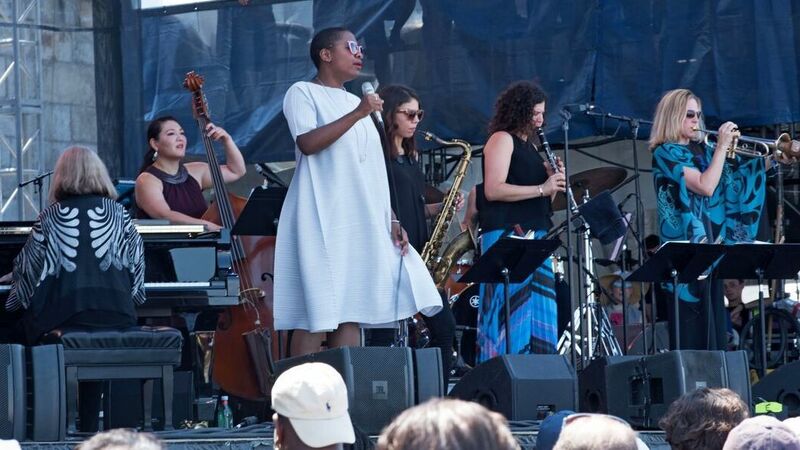 Jazz Night in America caught up with Artemis at the 2018 Newport Jazz Festival, where the band's commanding set included both originals (like Rosnes' "Galapagos") and jazz standards (like Thelonious Monk's "Brilliant Corners"). And we sat in on a conversation between Cohen, Jensen and journalist Natalie Weiner, which touched on both the magical qualities of the group and some of the challenges its members have faced as female musicians in what's still a male-dominated field. "I don't think we're there yet, where somebody would look at a group like Artemis and just think of it as a band without actually having to mention, 'Oh, it's an all-woman band,' or 'It's an all-female band,'" Rosnes says. But listen to the music in this show and you'll understand how a project like this is making a difference — and plenty of noise, in the best possible way.